Summary East Japan Railway Company (JR-EAST) has established a committee for promoting ecology since 1992 and been doing best for simultaneous pursuit of environmental preservation and business activities. At the expansion of the shed of platform of Takasaki station of the Shinkansen bullet train, they decided to install PV system from a viewpoint of global environment problem. Because the platform is an elevated structure and the possible sunshine duration is long, it’s favorably situated for PV system. 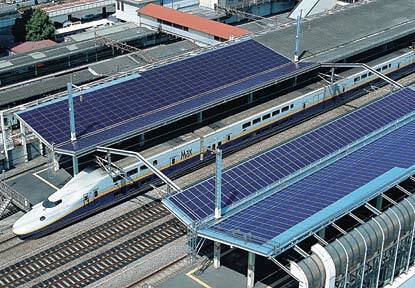 In 2001, the 1st 100kW PV system was installed, and in 2004 the 2nd 100kW PV system was installed. The PV system was installed as “Field Test Project on Photovoltaic Power Generation Systems for Industrial and Other Applications”, which is one of the demonstration project schemes. In this scheme, half of the cost is subsidized by NEDO and various kinds of operational data are monitored.